Stylishly decorated with all new paint, new fixtures, upgraded furniture, and all new flooring…gorgeous, wide-plank maple floors! Inviting and well-appointed with all cooking/entertaining necessities, Gas Grill, 4 TV’s, 4 DVD’s, 2 VCR’s, Stereo, POOL PRIVILEGES @ DAYS INN, WiFi etc. Wall of glass doors opens into a lush private courtyard built for restful outdoor dining that expands into a fenced backyard (great for kids!) …2 bedrooms have direct access to courtyard! Lovely mid -century modern beach cottage! Wonderful nooks and crannies- around the corner to the beach access- perfect! Must go to Driftwood beach. We stayed at this property the week of October 22nd. We loved the layout with bedrooms on opposite ends of the house, the backyard patio that gave us privacy and protection from the rain, and the overall comfort of the place. A well thought out floor plan, house is not cluttered giving the 5 adults there plenty of spaces to cook, play games, especially difficult jigsaw puzzles!! Used gas grill twice, easy walk to beach. We had a great time. Plenty of room, clean and comfortable. Very nice house. Clean and spacious for the six of us. The kitchen was well equipped, but a dresser would have been nice in the bedroom next to the kitchen so we could unpack suitcases. We have been coming to Jekyll for 24 years and this was a great house to spend the week in. We were sad to leave!! Our stay at Blissful Oaks was wonderful. The layout of the house is very accommodating as well as the location to the beach. Regardless that Irma decided to make an appearance we really enjoyed our stay. We most likely will rent Blissful Oaks next year. This is our 4th year at this house and we are always so happy with this rental - fantastic house and location !! We have vacationed at Jekyll Island for many years (some of us for more than 50 years!) and this was one of our best! Blissful Oaks was quite comfortable and accommodated 3 generations of us. It is in a great location on a quiet street and is updated enough to provide modern amenities but the character of its history fortunately remains. I would recommend this property to others and hope to stay there again. Great property and location, second visit at this property and will stay again. Would be helpful if there was a dresser in bedroom off of kitchen. We were very impressed with the wall of glass that looked out to the patio. We thought with all the trees on the property, that it might be too dark, but with the light yellow walls and the sunlight from the patio, it was very cheery. Our stay ay Blissful Oaks exceeded our expectations! 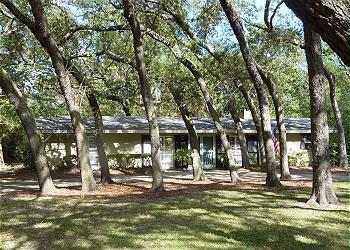 The property was very well maintained, comfortable beds and living area. We enjoyed having family visit and cooked Thanksgiving dinner for everyone! Fantastic memories! Good, nice, relaxing. Would have liked to be able to go to pool a couple of quick times! Grandkids like to swim laps and play in pool! The house is nice and conveniently located. Kitchen amenities were good. There seemed to be more bug issues than I have ever encountered in 25 years of staying at Jekyll. The roach and spiders in the house seemed to be in more abundance than we have experienced in the past. Just a couple of suggestions for the property maintenance staff: One of the bedspreads had a large stain on it that looked like orange soda. The bedspread may have been washed, and therefore clean, but the stain was a turnoff. I found clothes in the washing machine that had been washed by a previous renter and forgotten, so please check the washer and dryer after each renter checks out. Also, when I booked the house, I was told that we would no longer have pool passes for the Beachview Club, but it would instead be at the Days Inn. After arriving, I learned we would not have any at all. This was disappointing for my youngest child and one of the mail things she had looked forward to doing. Otherwise, the house was perfect for our family. The beds were very comfortable. Quality mattresses and pillows. All in all, a great property and a great stay. We have rented places from Jekyll Realty for the past 3 years, and have always been pleased with both the rental units as well as the service. Layout of house was perfect - Had one problem with plumbing and Property Manager took care of that day. In all I would give our stay a 10. 10 being the highest!